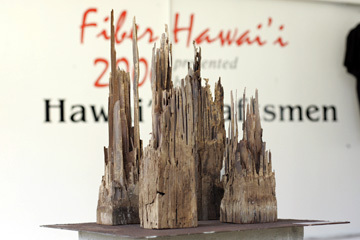 Hawaii Craftsmen's "Fiber Hawaii '06" is on display at the ARTS at Marks Garage through May 27. Above, juror Pat Hickman's "Hunger" is a cement, rusted metal and wood piece. Hawaii Craftsmen's annual fiber show invites artists to push beyond the boundaries of traditional fiber arts. It's not uncommon for artists to use ceramics, glass or metal, for instance, in the juried exhibit. The tie-in to fiber is that the works refer to fiber or fiber techniques. 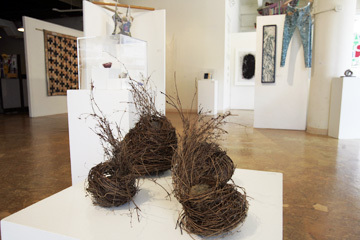 "Fiber Hawaii '06," which runs through May 27 at the ARTS at Marks Garage, was juried by longtime University of Hawaii art professor Pat Hickman. Hickman, who retires this year, has headed UH's fiber program for 16 years. This year's crop of works are not much different than those of recent years. In the traditional vein, Barbara Davis and Lisa Louise Adams put together intricate quilts, and Berne Kuebitz created a hapi coat of vintage kimono. Noriyuki Suga's "Family Poetry," a rock and vine work, sits in the foreground of this shot of the exhibit space. Other artists pushed the envelope: Bernice Akamine used beads and wire to create a woven cocoon around glass; Elaine Wender made several works using paint and fiber, gut and crayon; Jackie Mild-Lau put together a whimsical newspaper and wire sculpture; Alicia S. Kawano Oh wove a striking necklace adorned with wire and raku; and Martha Ridgley devised a creative gown of videotape and hardware. And juror Hickman contributed a sculptural piece made of cement, rusted metal and wood. The work is reflective of Hickman's focus; she is known for her 3-D works and her interest in translating fiber to metal. "Fiber Hawaii '06" is on exhibit at the ARTS at Marks Garage, 1159 Nuuanu Ave., at the corner of Nuuanu and Pauahi streets. Gallery hours are 11 a.m. to 6 p.m. Tuesdays to Saturdays. Call 521-2903. 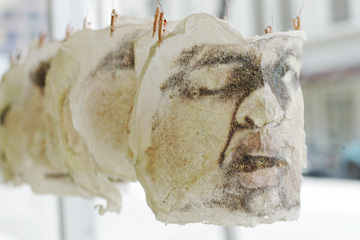 Christopher Aradanas' work is a kozo, laser transfer and papier-mâché piece. 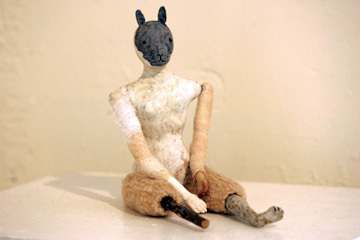 May Izumi's "Rabbit Looking for Luck" was made with fiber and ceramic. 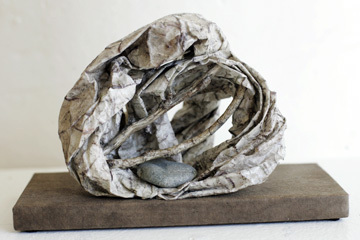 Allison Roscoe worked with paper for "Sheltered." 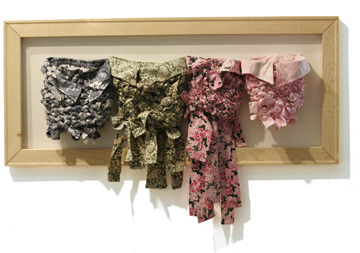 For the colorful "A Portrait of My Ohana," Yoshiji Hirose knotted pieces of aloha shirts.